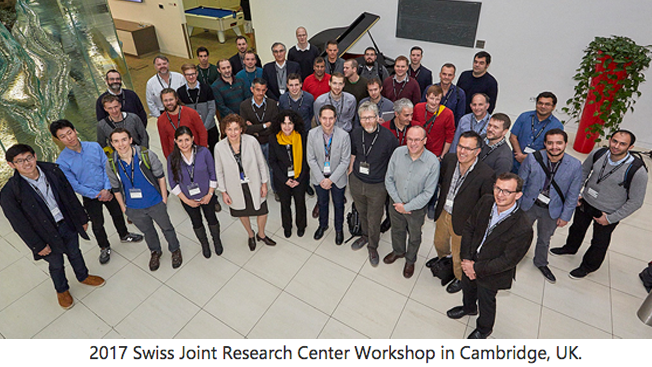 Researchers from EPFL, ETH Zurich and Microsoft Research – all partners of the Swiss Joint Research Center (Swiss JRC) – assembled for a workshop at the UK-based Microsoft Research Cambridge Lab in February. Four of the projects bring together researchers from ETH Zurich and Microsoft Research. The six projects between EPFL and Microsoft Research are: Towards Resource-Efficient Data Centers; Near-Memory System Services; Coltrain: Co-located Deep Learning Training and Inference; From Companion Drones to Personal Trainers; Revisiting Transactional Computing on Modern Hardware, and Fast and Accurate Algorithms for Clustering.